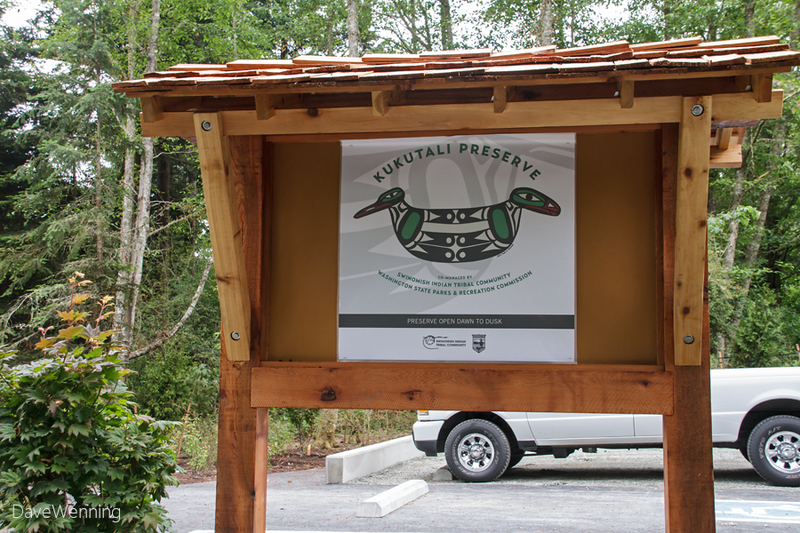 Kukutali means "place of the cattail mat" in the Lushootseed language. It was the traditional name for the island. 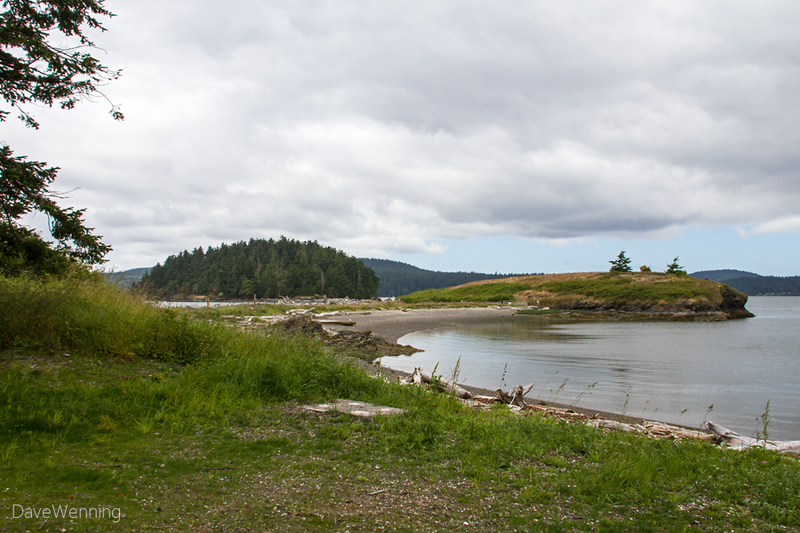 Historically, this was a place of seasonal food gathering by the Swinomish people. The name refers to temporary shelters made of cattail mats. The logo represents a cattail mat creaser, a hand tool used in making them. The two heads represent the Swinomish Tribe and Washington State Parks who have come together to manage this special place. 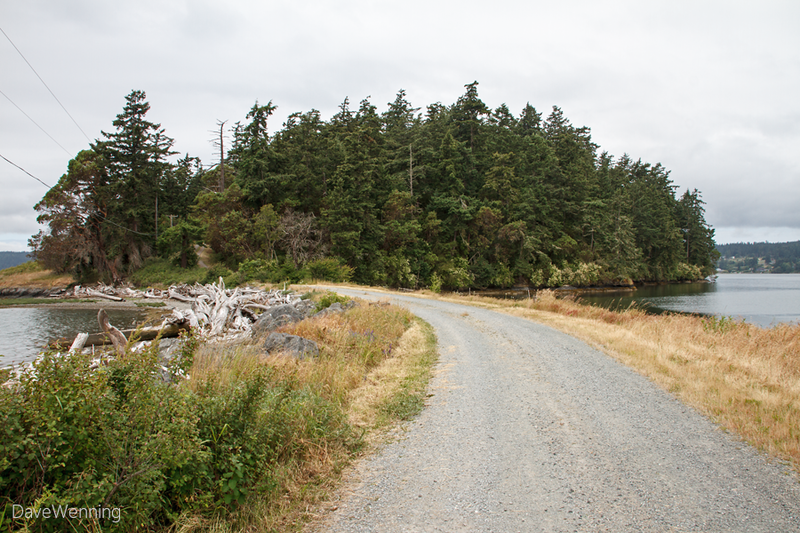 From the parking lot, a roadway leads to the island. For decades, the island was privately owned. Only a small piece was developed, allowing most of the island to remain pristine. 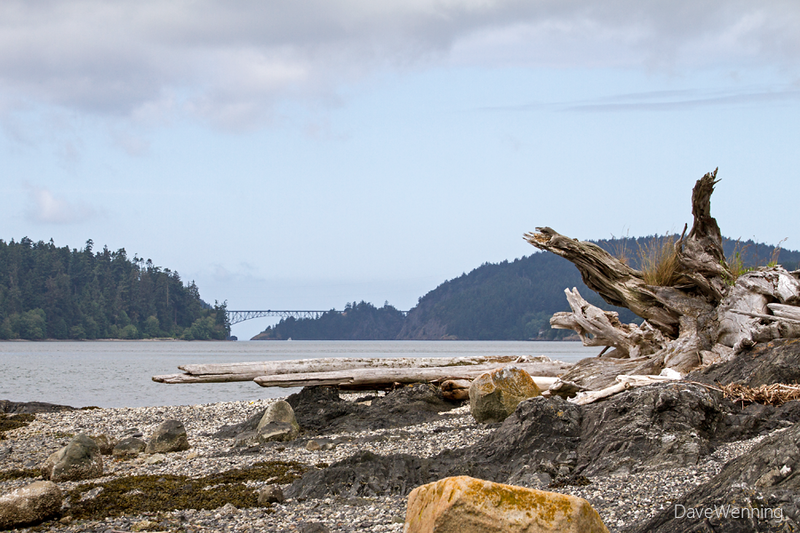 It is one of the last natural islands in Puget Sound. There are a few rules that visitors must observe. Access is by foot only during daylight hours. No motorized vehicles, bicycles or horses are allowed. To protect wildlife, please leave pets at home. No fires or overnight stays are permitted in the Kukutali Preserve. Don't forget to display your Discover Pass in your vehicle. The main road crosses through the center of the island. 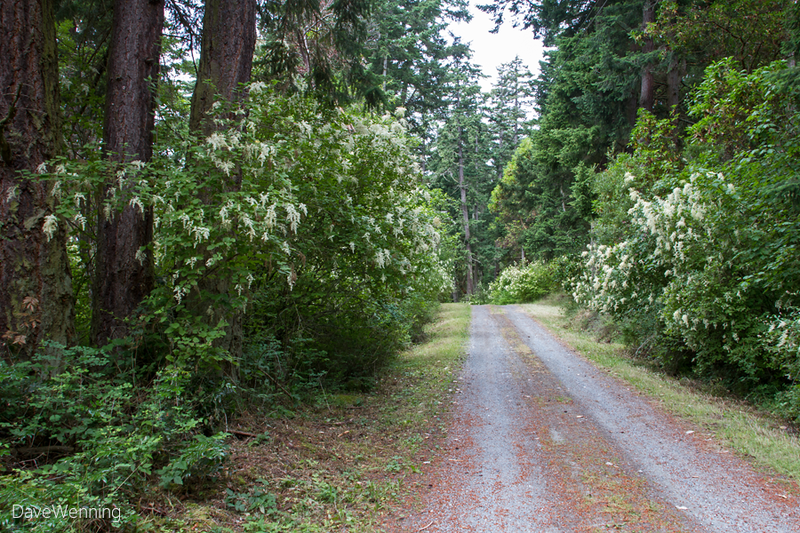 Oceanspray (Holodiscus discolor) is in spectacular full bloom right now. 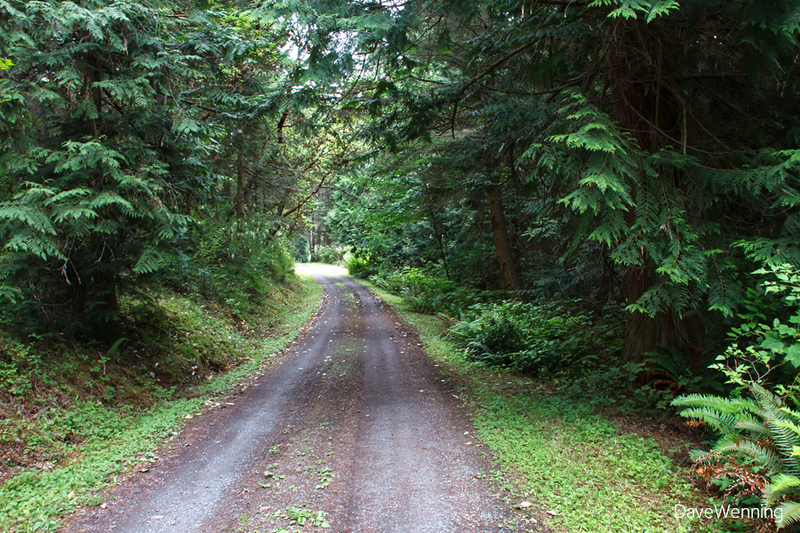 Watch your step on the roadway and the trails. 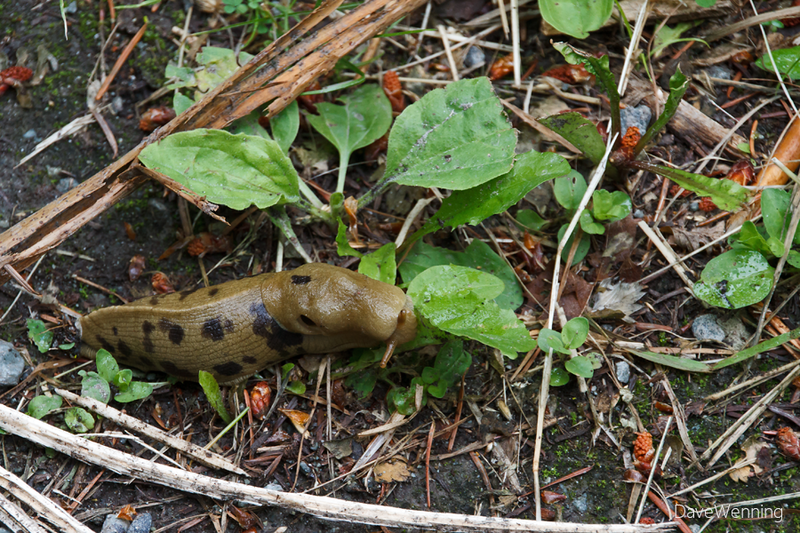 Banana Slugs (Ariolimax columbianus) have the right-of-way and there are a lot of them. This one was making a meal out of Broadleaf Plantain. I keep reminding people that Banana Slugs are not garden pests and should not be killed. They are an important part of the forest community. They deserve your respect and protection. You can read more about these Kukutali denizens at Wild Fidalgo. 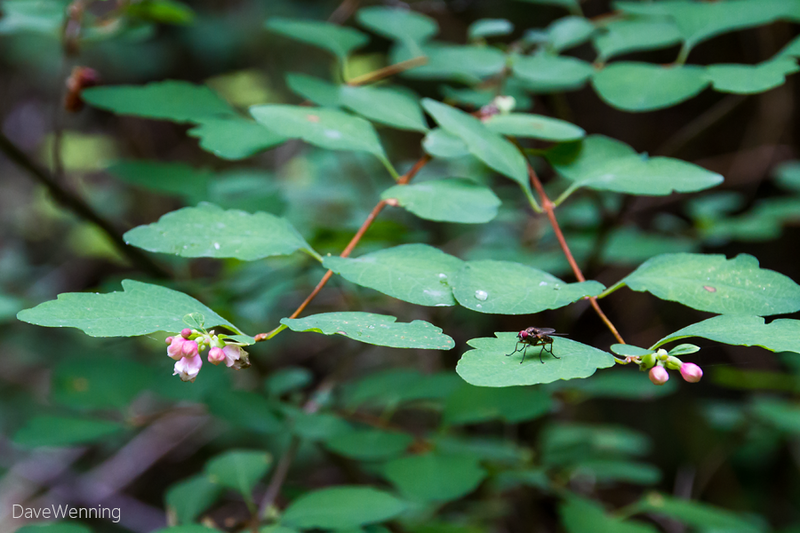 Common Snowberry (Symphoricarpos albus) is growing everywhere along the trails and is starting to bloom now. I am not sure I have ever seen a fly with big red eyes. Does anyone know what kind it is? Reaching the end of the road, I notice that the Dunlap house is gone now. There are photos of it in previous posts here and here. I know the goal is to preserve the island in a natural state, but a piece of me misses that house, just a little. The boathouse ruin that sat in the cove between Kiket and Flagstaff is also gone. There is a picture of it in this post. It had a small laboratory attached and was used by marine biologists from the University of Washington in the 1970's. 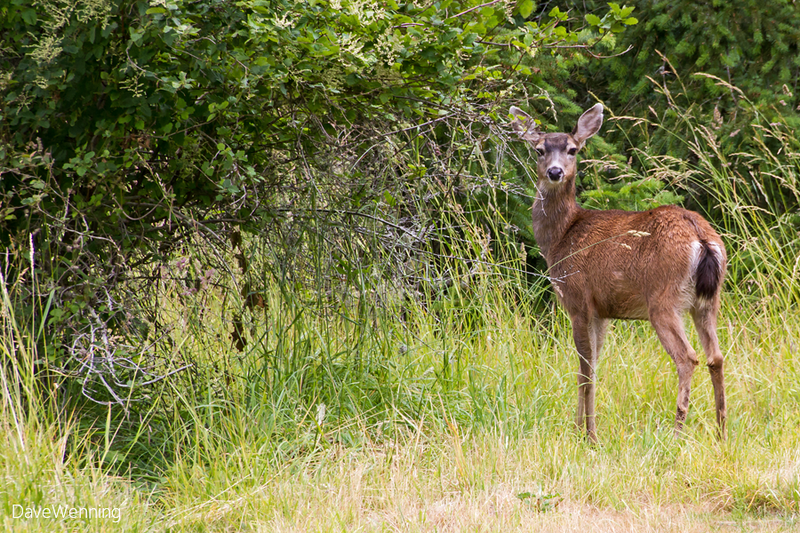 The small clearing behind the boathouse site is now the playground of Columbian Black-tailed Deer. We studied each other for ten or fifteen minutes. 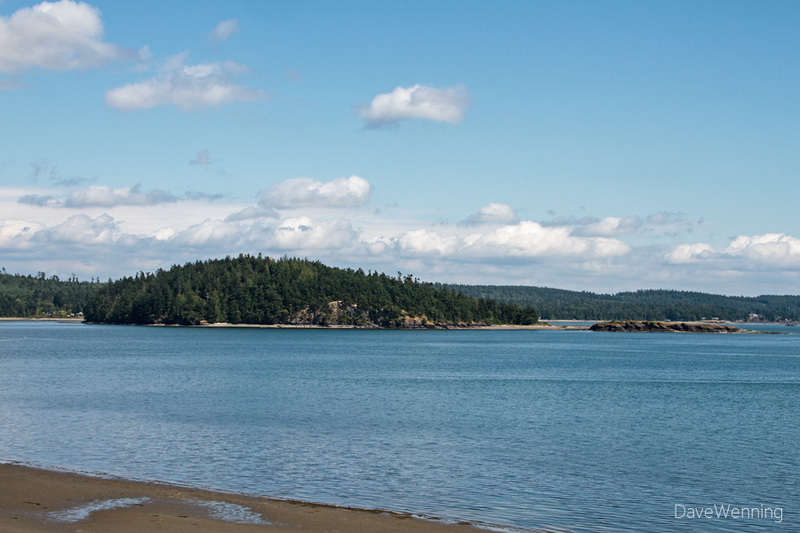 Deception Pass, about two miles away, can be seen from the south beach. Flagstaff Island is connected to Kiket by a tombolo. Flagstaff is off-limits to visitors. It is a fragile lowland meadow habitat and a nesting site for shorebirds. 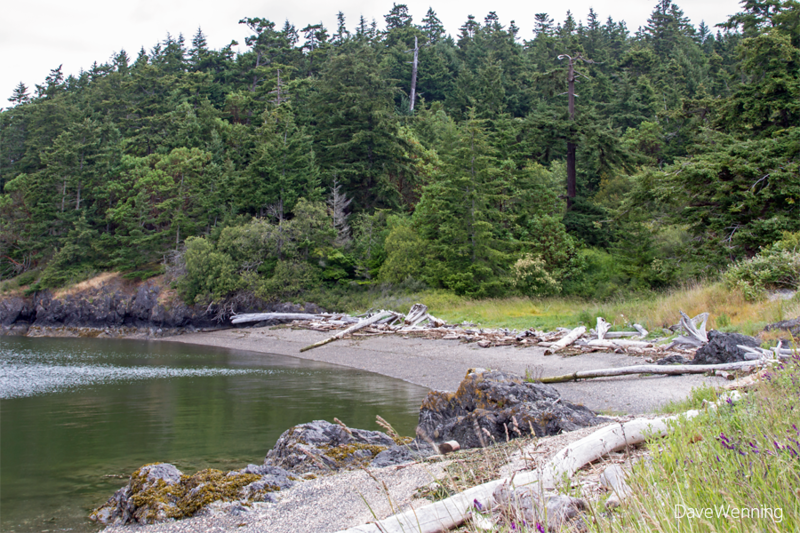 Beyond is Skagit Island, also a State Park site which features anchor buoys for boats, diving and primitive camping. 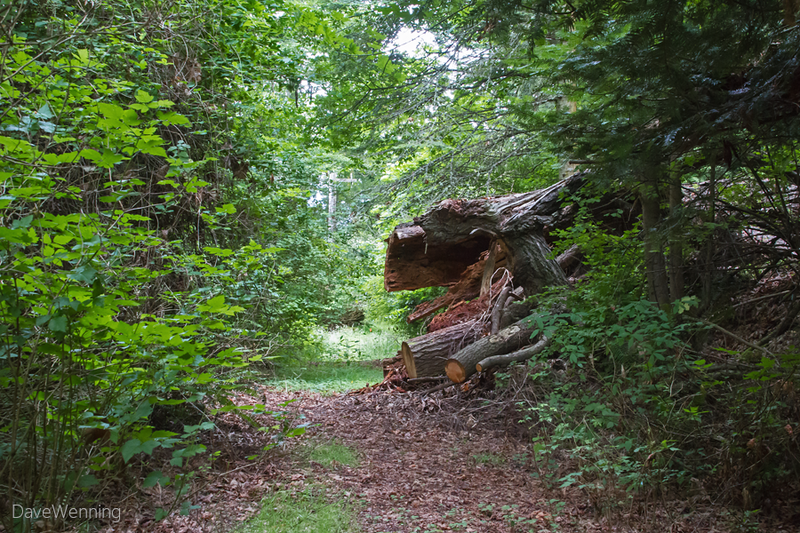 The North Trail is one of the new features of the Preserve. The environment is cool and shady. 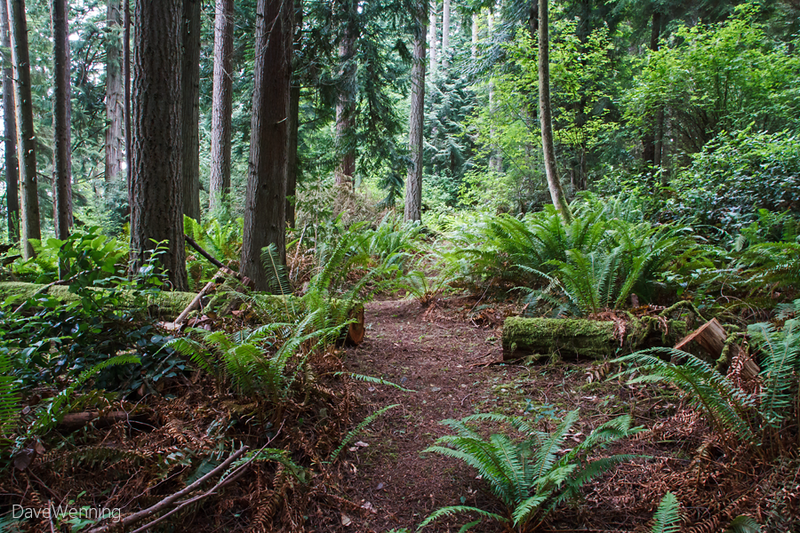 The trail is more primitive than the heavily trodden pathways around Deception Pass. That's how it should be here. I spotted a Douglas Squirrel, but he was camera-shy. 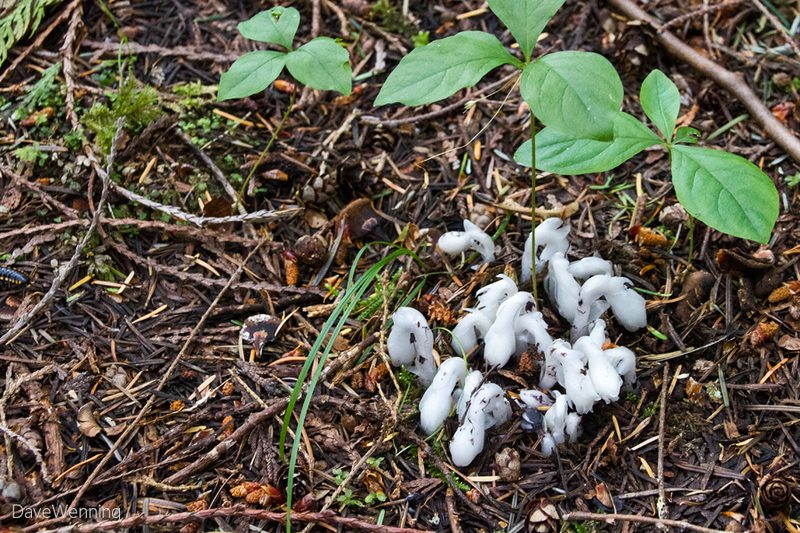 On the North Trail, literally right in the middle of it, I found Indian Pipe (Monotropa uniflora) just emerging from the ground. When fully sprouted it will look like this. It has no chlorophyll and does not require sunlight. Instead, it acquires energy from mycorrhizal fungi associated with the roots of trees. It is perhaps the oddest member of the Heath family (Ericaceae) and thus related to Rhododendrons, Madronas and Salal. It is also called Corpse Flower and Ghost Plant. The new South Trail is a wide boulevard compared the the North Trail. 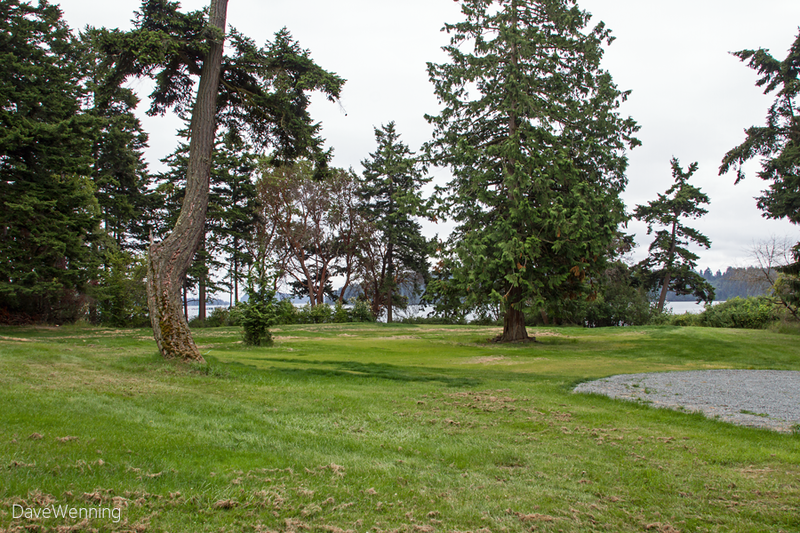 It is also drier and warmer on this side of the island indicated by many Madrona trees. 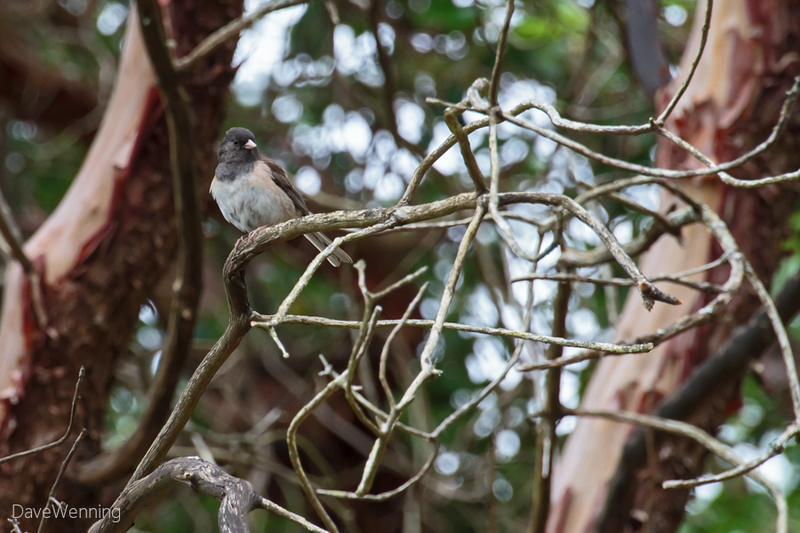 There were dozens of Dark-eyed Juncos (Junco hyemalis) foraging on the ground on the south side of the island. They were also singing their hearts out. I was surprised to see them here. They quit visiting my yard in April and don't return until October. Apparently, this is where they go. Besides the Juncos, I also heard Bald Eagles, Mourning Doves, Black Oystercatchers and several bird calls I could not identify. 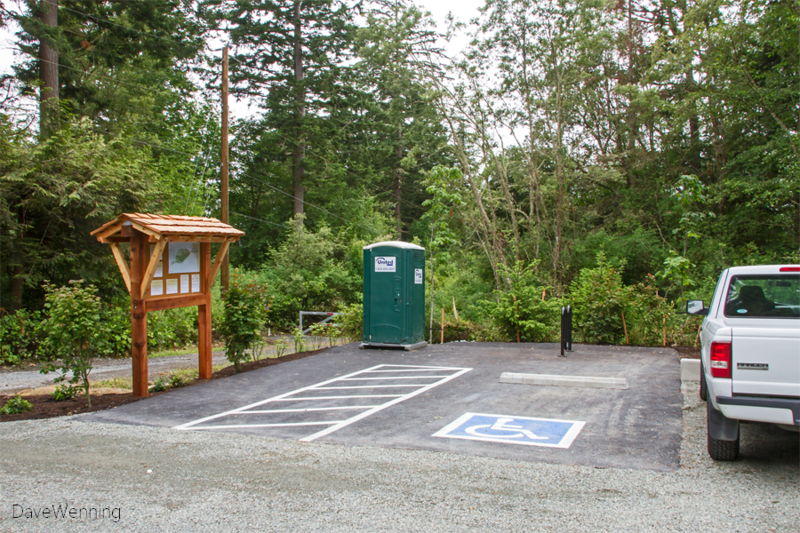 The Swinomish Community and the State Parks have done well here. I understand there are more refinements to come as budgets allow. I spent three hours on the island, but it still seemed to be rushed and superficial. I'll be returning many more times to study what the Preserve has to offer. Visitors who come here should have a keen interest in the natural world of the Pacific Northwest. This is probably not a place that would have appeal for the average tourist. I am not trying to sound elitist. On previous visits, there were people in the groups who were just not interested in what was here. I could sense their boredom and desire to leave. On the other hand, if you love our nature and want to study it, you will find endless hours of great pleasure here. The Kukutali Preserve is the primeval Northwest in a small package.